Mixed of broccoli and fish, the freshness greeny vegetable and fish perfect nutrition into one. For those of you who run healthy resto, this dish will be a crowd pleasurer. Prepare mashed potato by pour the warm water into KNORR Mashed Potato in a stainless bowl. Mix it well until it is not sticky anymore and leave it. Roast Dory fish in the oven that has been smeared with the seasoning until it's well done. After that, roughly-minced that fish. Boil the broccoli until cooked and roughly-minced it. Boil the lasagna until cooked and leave it. Mix the mashed potato, fresh cream, salt, and pepper into a stainless bowl and mix them well. Cut the lasagna in the same size into two pieces and fill it with the mixed ingredients in steps 5 (potato, fish and broccoli) and roll it. Leave it for a while. Tomato sauce: sauté the onion, garlic, green paprika and oregano until they are cooked. Then, add minced peterselly, KNORR Chicken Powder, black pepper and salt. Mix them well. 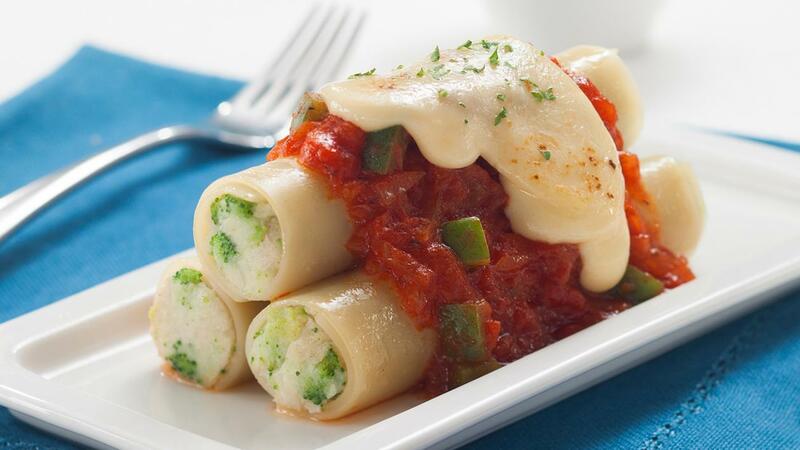 Arrange in a gratin dish: cannelloni, pour the tomato sauce and add grated mozzarella cheese. After that, bake it in the oven until the cheese is melted and turning into brown. Serve while warm.